Today, Illamasqua is unveiling their new Summer 2013 Paranormal collection! Everything looks amazing, but of course we are most interested in the nail polishes here! These babies are going to be UV-activated! I am so hoping that these are not gimmicky, and have a really strong effect under UV lighting. Knowing Illamasqua, they are probably great, so I'm not too worried. I don't know, are you guys as excited about these as I am? Am I crazy?! I know what you're thinking: this...this is not nail polish! My only explanation is that I had to share something I love so much even though it's not polish related*! So this post will include my experience with Beautylish.com, as well as a review and swatches of some of the Inglot shadows I picked out- as well as the customizable Inglot Freedom System. Everything is packed really beautifully, very boutique-like, and there are little handwritten notes. There was really a lot of attention to detail, and I was impressed. Since I ordered twice from Beautylish in quick succession, I got a note that said, "So happy you are back so soon..." Haha, yep. Inside, it also comes with a mini size of their Lash Genius, which is a clear curling mascara that you can use as a mascara topcoat to waterproof any other mascara you use underneath. So pink! Now, I'll probably never wear pink eyebrows, although who knows, but I am excited to try this as a mascara. Now let's get into the Inglot stuff! 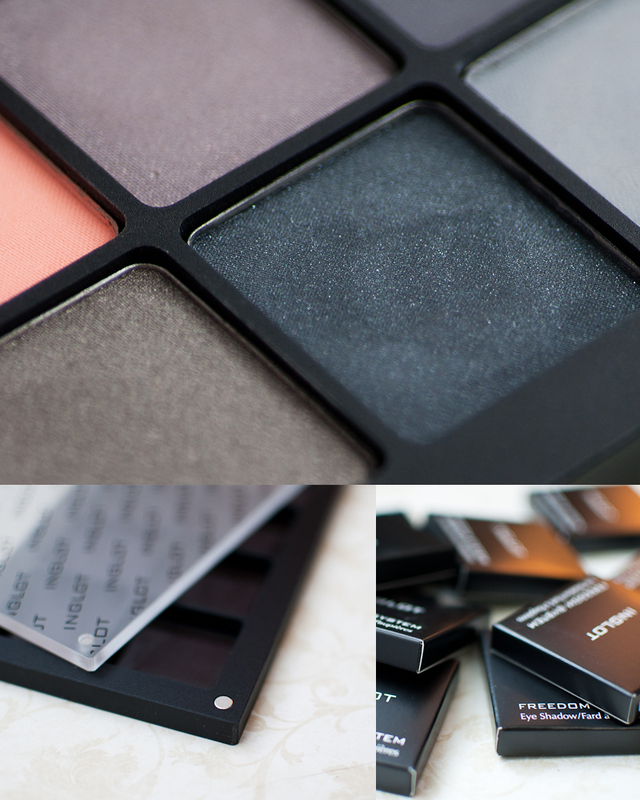 Inglot's Freedom System basically consists of several variations of empty palettes which you can fill with your choice of eyeshadows, blush, brow powder, concealer, face powder- ect. It's the holy grail of customizable makeup, basically. For eyeshadow, there are two-pan palettes, four (square) pan, five pan, ten pan, and twenty pan (also square) palettes. I believe there are also forty pan palettes (!!! ), but they're not available on Beautylish. The shadows are USD $6.00/e, and the ten-pan palette, for example is $16, by itself. The packaging is super sleek. My favorite makeup packaging of all time! It's solid and sturdy, but modern, and not too bulky. Unngh. There's a translucent lid that is connected only by magnets- one on each corner. The magnets are very strong, and to remove the lid you can pull it off, or just sort of slide it laterally. The palette itself, and the eyeshadow pans, are also magnetized. On the back of each pan is the eyeshadow's name (which is a number), as well as the amount (2.3g- 2.7g, varying between finishes, but very generous!) contained, and Inglot's branding. The peachy shade is 312M, a beautiful matte peach, which is very pigmented. The dark bluish-grey is 498DS, a great crease or outer-V color. Swatches! They are in the same order as in the palette, moving left to right, and are shown over naked skin with no primer. The pearl finishes are just lovely. About the quality: I find these to be very, very pigmented. They are soft and buttery, and blend very easily, with almost no fall-out. They do create powder when you drag a brush across the pan, but that doesn't translate to fall-out on the face, somehow. They have great lasting power! I do wear them with a primer, since I have very hooded eyes, but some people might not need to. They are true-to-color from the pan to your skin without being layered over a primer. These are really a joy to use, and are the nicest eyeshadows I own, period. 1) The shadows don't have names, only numbers. This makes it hard to remember which are which, and is just a general bummer. Go to the hardware store and acquire a very strong magnet. Your average fridge magnet is probably not strong enough, but give it a try anyway. Once you have a good magnet, rearranging the shadows is a breeze- they pop right out. As you can see, the product is recessed slightly in the pan, so you won't damage your shadows this way when using the magnet. Still very neutral-oriented, but there are a couple more pearly finishes in this one, and I find the brownish colors really divine. I don't know which is my favorite, but I do tend to use this one more, I think? I may yet end up rearranging the shadows between the two palettes, grouping more of the warmer shades together, and the cooler ones together, which is the beauty of the Freedom System: you can rearrange to your OCD heart's content! If there is enough interest, I can swatch this one as well. Here is the link to the second palette (above) swatched! I'm just super impressed, and can't wait to get more! Have you guys ever tried Inglot or ordered from Beautylish.com? 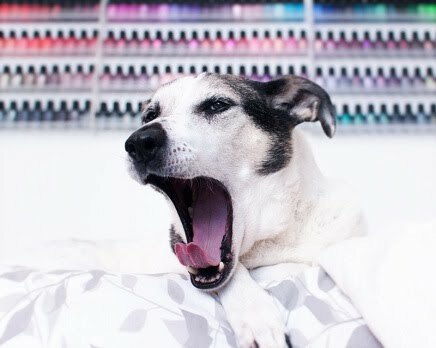 I originally wanted Polish Hound to remain solely nail-oriented when I first began, but lately I'm thinking I might like to add other beauty-related things here and there. I love all sorts of makeup, and I bet many of you who love nail polish might also have an interest in other beauty/ makeup products. The non-polish posts would probably be few and far between. What do you think? If this is a terrible idea, please let me know! If you ever order polish online, you know that finding a parcel on your doorstep with a 'FRAGILE' sticker is the most exciting thing! The polishes come so nicely presented is a tissue-paper-wrapped polish brick of sorts. I'm so excited to try these out! Today was a good polish day. I will be swatching these very soon, so stay tuned! Recent Accent Nails, Edition #2!